"Sorry...drifted off for a minute there." Every occupation brings with it the prospect of retirement. 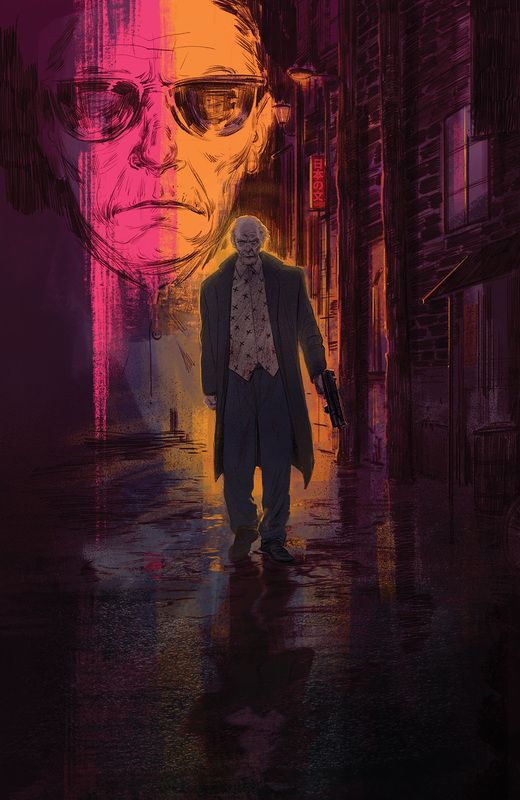 What one does with the newfound time off varies from person to person, but it's safe to assume that a retired hitman is going to spend his time a little differently. 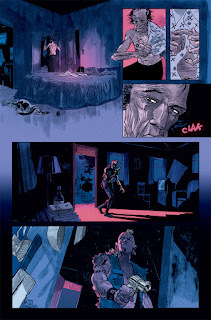 Sometimes though--as in The Last Contract #1 from BOOM! Studios--you're drawn back into the thick of it. The issue is written and lettered by Ed Brisson, illustrated by Lisandro Estherren and colored by Niko Guardia. A retired hitman, known only as “The Man,” is forced back into the game when a list of his kills is leaked by a mysterious blackmailer. The list makes targets out of anyone associated with one of the The Man’s previous jobs, not to mention The Man himself. As he fights to protect those the list exposes, The Man sets off to uncover the identity of the blackmailer so he can move on with his new life once and for all, but will the truth ruin those chances forever? Brisson paces The Last Contract #1 exceptionally well. The story unfolds pretty cleanly from the start, with Brisson introduces the reader to The Man as a quiet being still capable of holding his own when necessary. 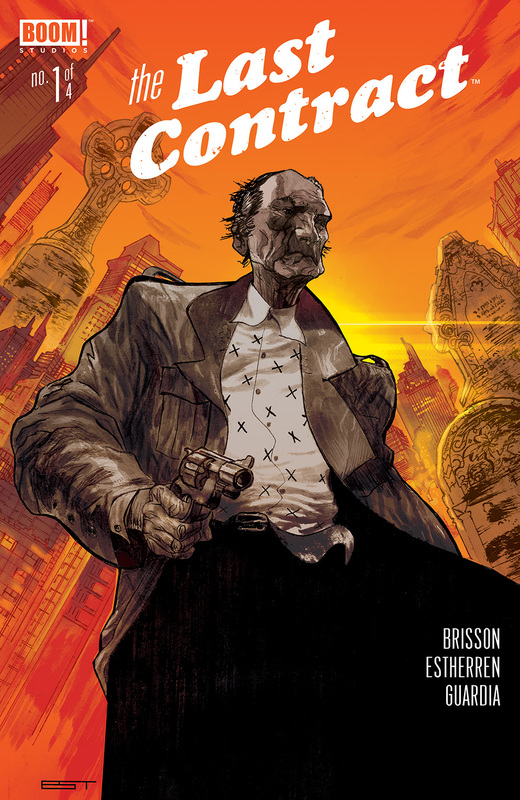 There's a great introduction to him in the very beginning and Brisson doesn't waver in presenting him as a skilled hitman in retirement. By the end of the issue, he's something of an unlikely hero as he's investigating what makes him such a target and it works. This is the most notable aspect of the book, in that Brisson does a fantastic job of carrying the narrative through one central character. 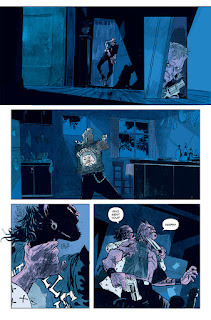 There's a grittiness to the illustrations that Estherren adds courtesy of the somewhat grimy character designs. These characters look like they inhabit the world illustrated with vague backdrops and a general sense of despair throughout. Estherren presents the characters with an elongated sense of presence throughout the issue and they interact with one another in a way that doesn't entirely feel natural. 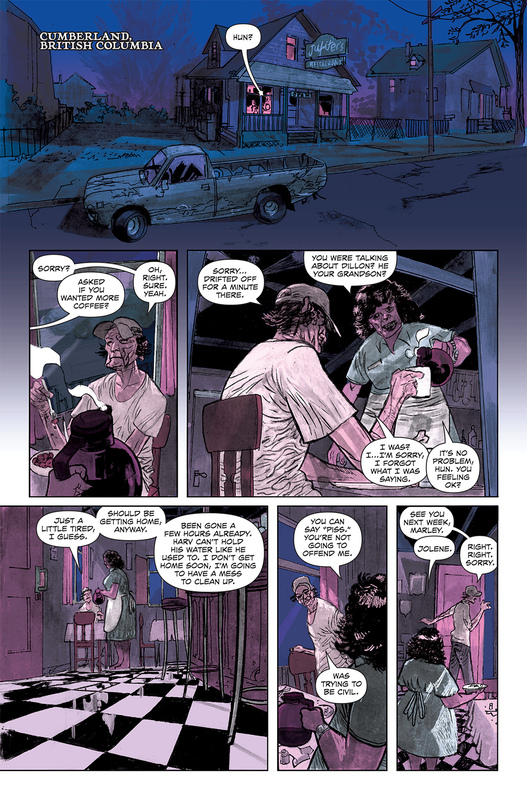 There's a pretty unconventional panel layout that Estherren breaks up occasionally with characters who stand outside them, as well as panels that overlay gutters and one another. 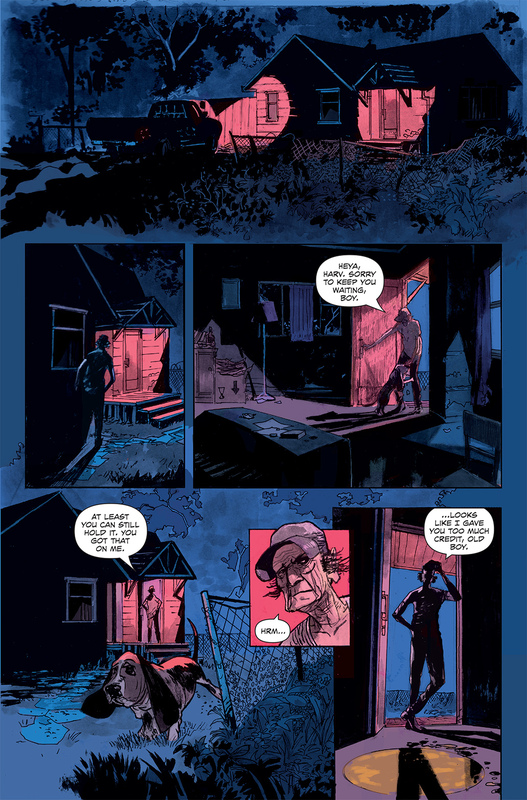 Guardia's colors are primarily blues and pinks, both of which combine to create a very chilling effect on the atmosphere. 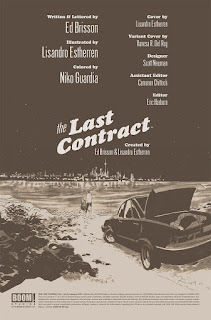 The Last Contract #1 comes out the gate running and doesn't stop from there. 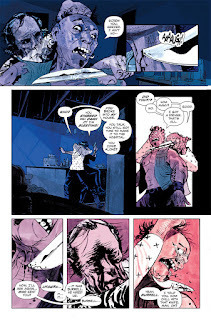 The premise is exciting and gives readers a hitman who wants to be left alone, but doesn't hesitate to defend himself when accosted. Brisson's script is fast-moving and is effective at setting up the entirety of the series. Estherren's artwork is a great fit and works in a griminess to the proceedings. 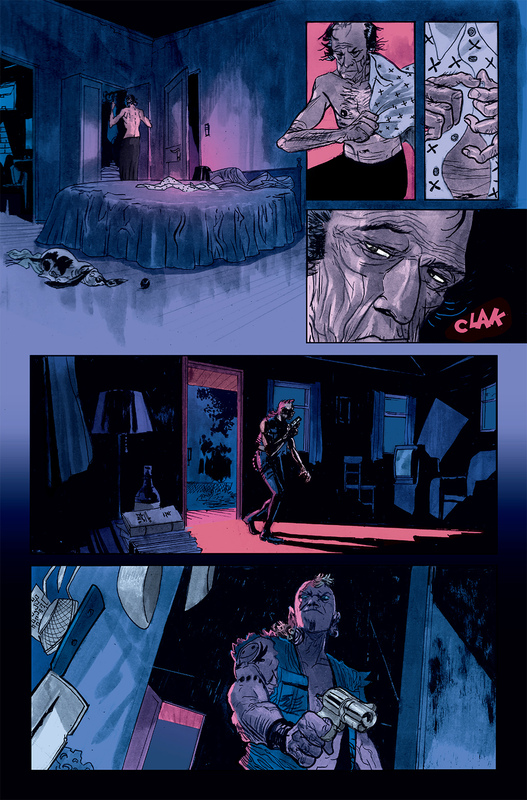 The Last Contract #1 is a solid start to what's shaping up to be a fast-paced series. 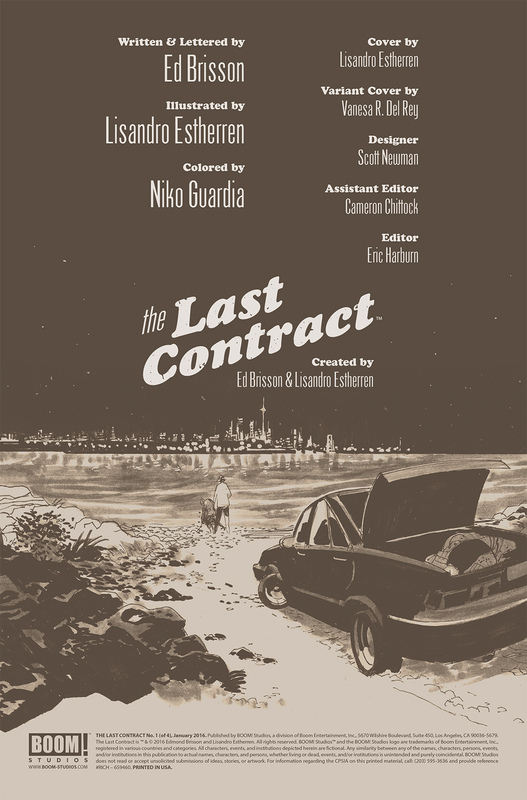 The Last Contract #1 is in stores now.